Most people are perplexed about the Vedas. Very few have read them, and those who have find them difficult to understand. They can’t make sense of its many divinities, sacrifices, rituals, riddles and paradoxes. The reader of the Veda wonders why these (and other countless) luminaries say nice things about the Vedas when they can’t see it themselves in the translations of the texts that they have. Some make sense of this in their minds by believing that the meaning can only be attained after a whole life time of sādhanā, that is spiritual practice under the guidance of a qualified Guru. In my view, the problem is that literally all academic translations of the Vedas are unsound. They may be faithful in literal rendition but mostly the deeper and contextually correct meanings elude them. These translations are like the map of a city made by a mouse, which may be accurate in the depiction of the many pathways, but totally missing in the broader or deeper picture. In order to explain the secret of the Veda, I take the very first mantra of the Ṛgveda. Agni is fire, but how can it be Priest, God, minister of sacrifice, and the rest that follows. And why is it important to have a priest or minister of sacrifice? What is the meaning of sacrifice? What is God, if we don’t see him anywhere? Why is Agni “God” and why is lauding him important or relevant? Why speak of things that cannot be tested? It is a jumble of words that takes you nowhere. You stop and give up. To get to the deeper meaning, we must first understand who Agni is. To the uninitiated, Agni is the physical fire that one can see. But the deeper meaning of Agni is the light (or spark) within that lifts the veil on the lamp of consciousness; yet another meaning is Vāc or speech. Devam, translated by Griffith as “God” is from the root div which means light. (Many years ago, I showed in my book The Gods Within that the devas are the cognitive centers in the mind. [Note 2]) The word “God” is meaningless here excepting in its primary meaning of Light. The devas are the centers of agency that are the constituents of our mind. I venerate Agni, the priest [purohita] who is the light [devam] and invoker [ṛtvij] of the sacrifice, the one who chants [hotṛ] and bestows treasure. Imagine that your habits and conditioning have thrown a veil on your consciousness, which they do, but this is something that I am not going to go further in here. 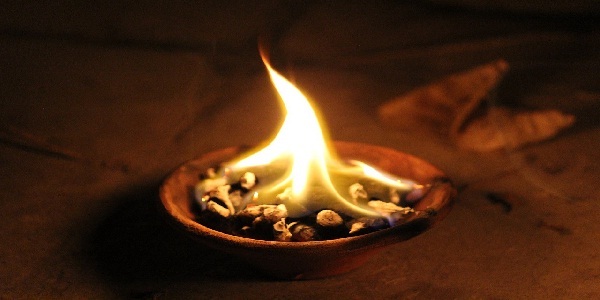 This veil can be penetrated by using the human manifestation of fire (that is speech of Agni the purohita in the chants as hotṛ) to connect with the inner spark (devam), so that the veil is dissolved and you are in touch with your true self. It is only momentarily lifted just like you are only momentarily in the present moment. Most of the time, we inhabit either our past (which is dead and gone) or make dreams about the future (which doesn’t exist). The idea of spiritual practice is to make that dissolution of the veil persist for ever longer period of time. The process of connecting from speech to inner light needs a bridge and that is the mysterious role of Agni as invoker. Why mysterious? Because we are not talking of things, but rather of the workings of consciousness, which is not a material entity. This process of invocation requires a mastery of the processes that are symbolized by the Goddess. What about treasures that are bestowed? The process of connecting to the source, if I may use that phrase, is transformative. It is also punarjanman, the rebirth, the end of the yajna, the sacrifice. When connected to the source, capacities that lay latent, come alive. The treasures that one comes by were within one’s reach all the time excepting one wasn’t aware of them, or one didn’t know where to look for them. In physics, it is like the directing of evolution by observation (something called the Quantum Zeno Effect that I have discussed elsewhere [Note 3]). What are the many divinities of the Ṛgveda? These are the lights at different points in the inner space of the mind, the embodiments of various cognitive capacities. If you use your senses at the deepest level to connect to the self, you are going from Agni to Indra (the heart of the senses) to the inner Light (Viṣṇu). If your focus is on the transformative processes within the inner cosmos, then this energy is Devi. If your desire is to follow to the root of your consciousness through a path of auspiciousness and equanimity, then the divinity is Śiva. There are any number of points of light that one may name variously that take us to the Source. (e.g. Note 4). These are not competing but complementary paths. What is the origin of this desire? It is one’s innate temperament and the milieu in which one is raised. There are different kinds of sādhanā to practice which are described in the Vedic texts, which are truly a manual of universal spiritual science or ātma-vidyā. Just the first mantra of the Ṛgveda opens up an entire world of wisdom and insight. This is the doorway to the secret of the Veda. It is the deeper connection between the two that prompted Swami Vivekananda to advice Nikola Tesla to look for an equation connecting matter and energy. S. Kak, Play of consciousness. 2018. With this paradoxical statements such as RV 1.164.50 become clear. One also sees the parallel with the Gāyatrī Mantra (RV 3.62.10). Why is Hindu Dharma Being Denigrated in Spite of Being the Most Reasonable System of Living?